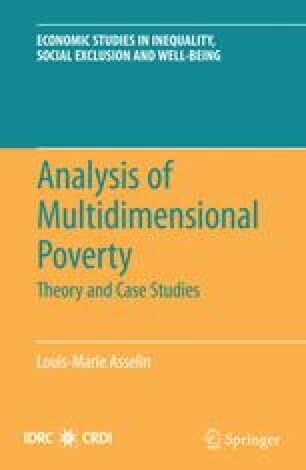 As stated in the introduction, our main objective is to operationalize multidimensional poverty comparisons. After some clarification on this objective and on a first methodological choice in Section 3.1, Section 3.2 presents a quick review of the main methodologies used to build a composite indicator of poverty (CIP). Our second methodological choice takes us to a short presentation of different variants of factorial approaches and to the argument supporting our third methodological choice, the multiple correspondence analysis (MCA) technique (Section 3.3). Finally, Section 3.4 develops the MCA technique and illustrates it with a numerical case study on Vietnam.